In 2011, U.S. fire departments responded to 370,000 home structure fires. These fires caused 13,910 civilian injuries, 2,520 civilian deaths, $6.9 billion in direct damage. On average, seven people died in U.S. home fires per day from 2007 to 2011. Cooking is the leading cause home fires and home fire injuries, followed heating equipment. Smoking is a leading cause of civilian home fire deaths. Most fatal fires kill one or two people. In 2012, 8 home fires killed five or more people resulting in a total of 44 deaths. Almost three of five (60%) of reported home fire deaths in 2007 to 2011 resulted from fires in homes with no smoke alarms or no working smoke alarms. In fires considered large enough to activate the smoke alarm, hardwired alarms operated 93% of the time, while battery powered alarms operated only 79% of the time. An ionization smoke alarm is generally more responsive to flaming fires and a photoelectric smoke alarm is generally more responsive to smoldering fires. For the best protection, or where extra time is needed, to awaken or assist others, both types of alarms, or combination ionization and photoelectric alarms are recommended. One-third (32%) of respondents who made an estimate thought they would have at least 6 minutes before a fire in their home would become life threatening. The time available is often less. Only 8% said their first thought on hearing a smoke alarm would be to get out! U.S. Fire Departments responded to an estimated annual average of 156,600 cooking-related fires between 2007-2011, resulting in 400 civilian deaths, 5,080 civilian injuries and $853 million in direct damage. Two of every five home fires started in the kitchen. Unattended cooking was a factor in 34% of reported home cooking fires. Two-thirds of home cooking fires started with ignition of food or other cooking materials. Ranges accounted for the 57% of home cooking fire incidents. Ovens accounted for 16%. Children under five face a higher risk of non-fire burns associated with cooking and hot food and drinks than being burned in a cooking fire. Microwave ovens are one of the leading home products associated with scald burn injuries not related to fires. According to the National Electronic Injury Surveillance System, two out of five of the microwave oven injuries seen at emergency rooms in 2011 were scald burns. Clothing was the item first ignited in less than 1% of home cooking fires, but these incidents accounted for 15% of the cooking fire deaths. Portable or fixed space heaters, including wood stoves, were involved in one-third (33%) of home heating fires and four out of five (81%) home heating deaths. In most years, heating equipment is the second leading cause of home fires, fire deaths, and fire injuries. Fixed or portable space heaters are involved in about 4 out of 5 heating fire deaths. During 2007-2011 smoking materials caused an estimated 17,900 home structure fires, resulting in 580 deaths, 1,280 injuries and $509 million in direct property damage, per year. Sleep was a factor in 31% of the home smoking material fire deaths. Possible alcohol impairment was a factor in one in five (18%) of home smoking fire deaths. About half (48%) of home electrical fires involved electrical distribution or lighting equipment. Other leading types of equipment were washer or dryer, fan, portable or stationary space heater, air conditioning equipment water heater and range. Electrical failure or malfunctions caused an average of almost 48,000 home fires per year, resulting in roughly 450 deaths and nearly $1.5 billion in direct property damage. During 2007-2011 candles caused 3% of home fires, 4% of home fire deaths, 7% of home fire injuries and 6% of direct property damage from home fires. On average, there are 32 home candle fires reported per day. More than one-third of these fires (36%) started in the bedroom; however, the candle industry found that only 13% of candle users burn candles in the bedroom most often. Nearly three in five candle fires (56%) start when things that can burn are too close to the candle. 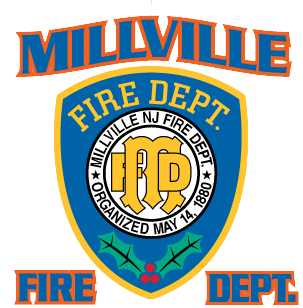 Disclaimer: Although the information on this site is believed to be accurate, the Millville Fire Department can assume no responsibility for errors and omissions.